I’ve decided to restore an old but still relevant lecture on why order is important in Adobe Photoshop files, particularly in team environments. 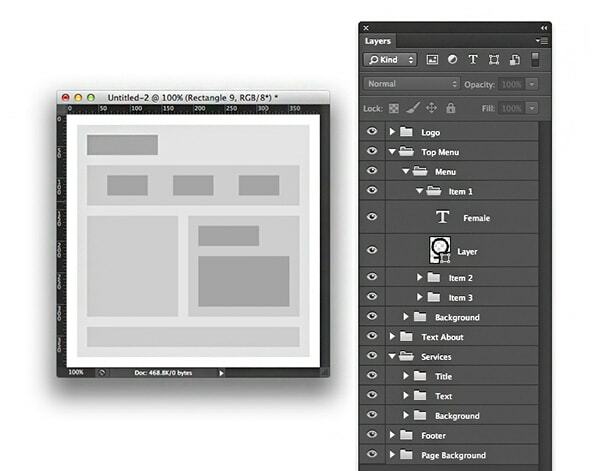 Proper ordering in layers and groups is required for the designer to understand the location of all elements. Let’s compare it with a workshop: If you scatter all your tools in a blaze of inspiration, another foreman will be unable to find anything, it won’t be comfortable for him to work, and he will many times curse you. This is the main rule. If you judiciously use group layers, there will always be order. This will also make it possible not to name each layer separately. For instance, if a button consists of a button and signature, they should be combined into a Button folder. A menu consisting of such a pair of buttons will become a Menu group. A background containing several layers will be a Background folder. The principle is clear: The logic of folder grouping should be consistent with your layout’s structure. Often, several versions of elements are stored inside a file — for example, button backgrounds of different colors. In order not to forget that a batch of strange hidden layers are versions of the same background, group them correctly. The easiest option is to create a Background folder, and store all versions inside it. But the ideal variant would be to duplicate the button-containing folder, naming each copy with an iteration number. Then, it will be clear that those are three versions of a single button – not only for you, but for all those great people working with the layout. 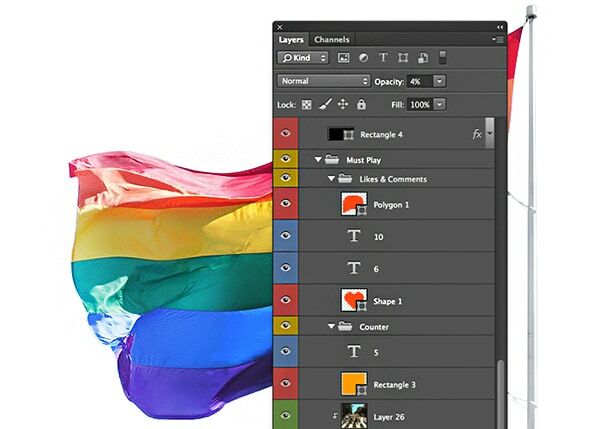 Many people like designating layers and folders with colors. Violet is for navigation elements, yellow is for text layers, etc. The problem is that color coding is understandable only to the creator. 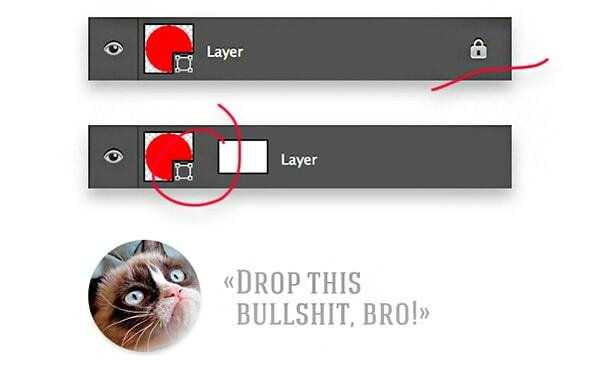 Designers often like to lock layers and work like this. But if you’ve left such a layer somewhere in the maze of folders, your colleagues will have to browse through all folders, as the entire root folder is blocked – it cannot be moved. Also, don’t forget about accidentally unpinned and forgotten masks. If your colleague doesn’t see such a mask and continues working, there can be a bulk of problems in the future. Believe me, many old designers still do not use layer styles and use bitmap layers. This brings infernal torture to those who subsequently try to modify the item. Guides help us. We can quickly make a grid or just align something. But we often use them once, i.e. align the object, and then forget about it, while guides keep accumulating. 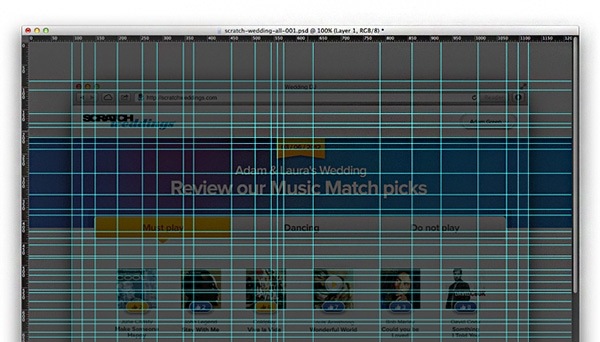 If you don’t make a neat grid with guides for the entire project, try to remove them immediately after use. If I was given ¢1 for each deleted layer left behind in projects, I would already be able to ensure the future of my grandchildren. Don’t forget to delete all the garbage after working with a file – you won’t need it anymore, but it will lie there and stink. Piece of file of a real project. You remember about layer coloring, right? Many people don’t like grouping items, combining it with the fact that they have to collapse them, which can be tiresome. In fact, they simply don’t know the function of the Alt key. After working with layers, click on the close symbol of the root folder while holding the Alt kay, and all internal folders will be automatically collapsed. 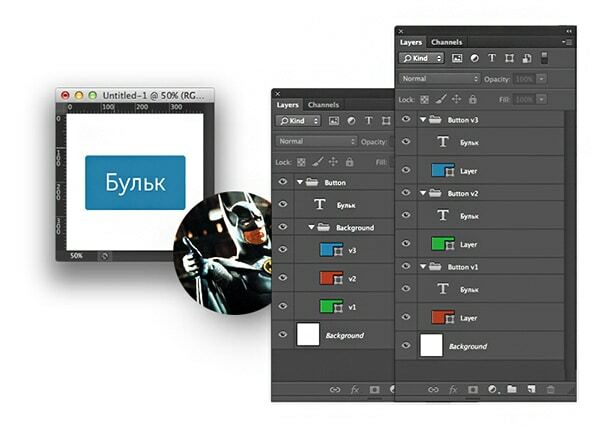 Try it out with Alt in other Photoshop functions, you will discover many new things. Thumbnail Contents. 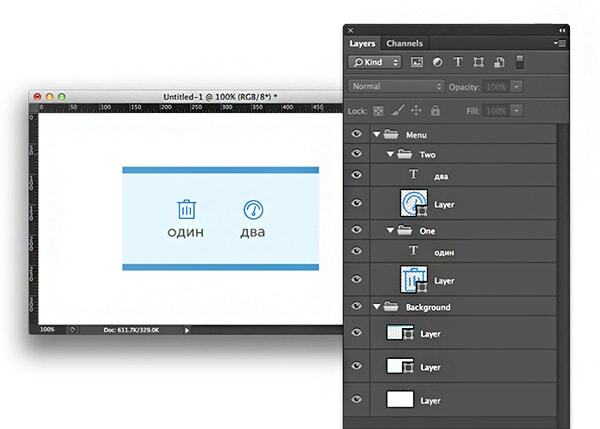 This trick allows showing not the entire layer in layer preview, but only those elements contained in it, i.e. clipping contents. Expand New Effects. By unchecking this box, you will automatically be able to collapse all the added styles of the layer. Add Copy. An absolute must — unselect. 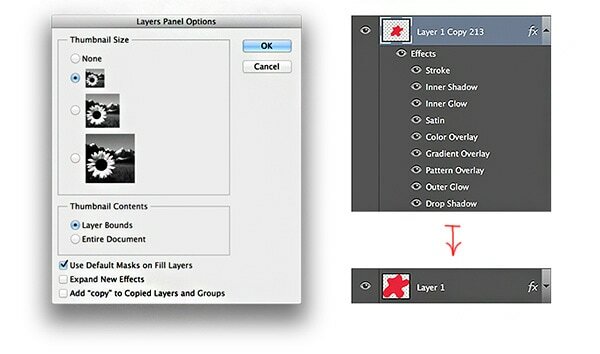 By unchecking this box, you will remove all those “Copy 230″ in layer names. Source purity will at once increase by 30%. 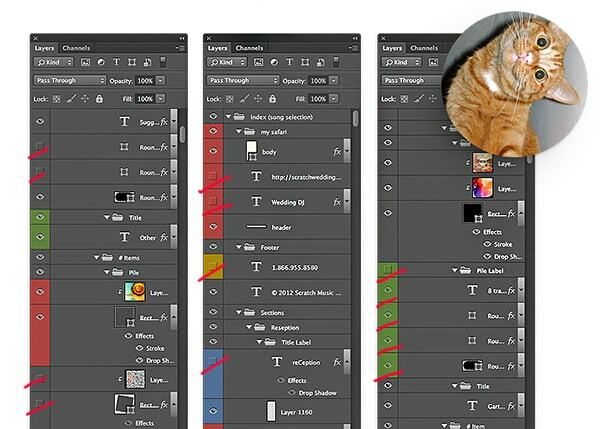 There are three hotkeys that you must know, understand and use — copying, pasting and clearing of layer styles. By creating all those “beauties” through styles and configuring their hotkeys, you will be able to copy them between layers, which will spare a few hours of your life. It may seem that all this only pins down your creative process, but, once having learned it, you will understand how much time it can save. And it is always great to have clean karma. Sergey Minkin is a UX/UI designer. He work at AltSpace company (part of Digital October Group holding), he design and visualize interfaces. A very well written piece that should be provided to students as required reading. I suggest adding layer comps to the post. I can’t tell you how many times I open a psd that is well organized but contains multiple web screens and is a nightmare to manage. This post gave me life. Seriously.The 80-lvl grid master bit was hilarious. Everyone who collaborates in Ps should read this. Great article covering the basics that everyone should know & be using. I have to agree with Stephen Chip, I would love to see an article about using Layer Comps when working in groups. As a designer, I know how much fellow designers & developers can get flustered by not using Layer Comps in project files. Thanks for the insightful post with amazing tips !! Very useful post for me as a beginner. Great stuff! A must read for any student starting out. It’s a nightmare when you receive a PSD that is a mess! I agree with 99% of this article, I always try to keep .psds neat. I also label and order my folders based on the DOM, “header”, “nav”, “article”, “section” and footer. There’s some .css class names in there too. This is a work in progress, I’m sure it could be improved, but it has been a good start for me. Great article Sergey. 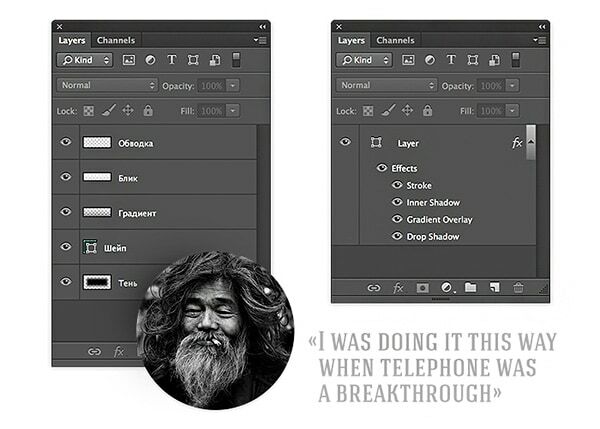 I can relate to this topic, as I work in Photoshop often. It drives me nuts when I open a PSD file and layers are not named and I have to go through it turning layers on and off to find out what they are. I always make sure when I am working on a project that all my files are well organized just in case I need to go back and work on them or hand them off to someone else. I also agree with Stephen Chip and Jen K that an Article about using layer comps would be great. I would add smart layers are sometimes overused, like guides. Very useful tips.. I am a Designer.